At Mobile World Congress this week, Puma announced their new phone made by Sagem. The device is a full-touchscreen phone with all the tech specs we've come to expect, like Bluetooth, GPS, camera, etc. It also has an integrated solar panel on the back, allowing you to recharge the battery using sunlight. The company claims you can get 2 hours of music listening out of 1 hour in the sun. Not bad! There's even an application for seeing how many phone calls, messages, etc. have been sun-powered. What's really unique about this phone, though, is the fact that it truly does its own thing. It's not trying to imitate the iPhone, or Android, or really any other device out there. Everything from the solar panel itself, to the OS the phone runs is completely unique. The company put an incredible amount of time into even the little things. For example, the settings are accessed by "peeling" the homescreen upwards. And the screen brightness is adjusted by using your finger to slide a cloud picture either more or less over a sun picture. It doesn't mean much, but it shows how much thought was put into this thing. The phone has tons of sports features, obviously. There are built in sports apps for running, biking, walking, etc. And it keeps track of all your various sporting activities. It even ships with an armband for running. By all accounts, this is a simple feature phone. It has a webkit based browser, but doesn't seem to support third party apps, dock accessories, or anything like that. But that's just the thing...it doesn't pretend to be a smartphone...and that's okay. The Puma Phone is really in its own category and the design works. It's coming to Europe this spring, no word on whether it'll ever be available elsewhere. 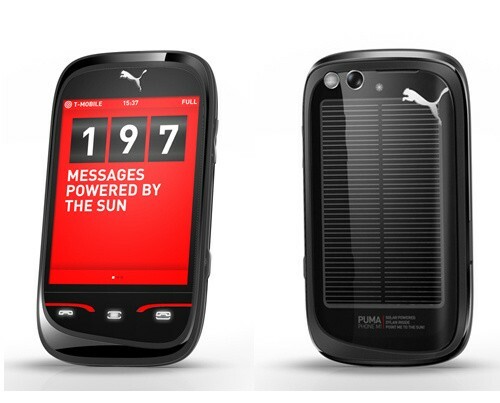 Read more about the Puma Phone here, here, and here.